You have arrived at the Website of the South Bristol Amateur Radio Club. On the various pages of this site you can find out about our current, past and planned activities, what you need to do to become a licensed Radio Amateur, who sits on our committee and how and when the club was formed. 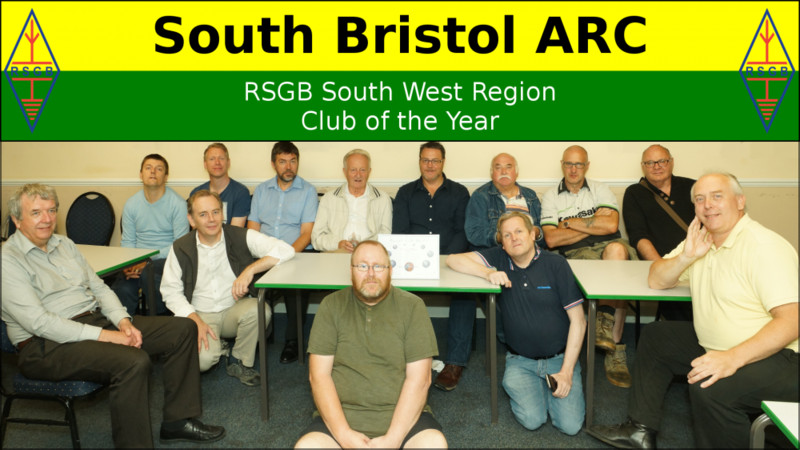 South Bristol ARC are justifiably proud of being selected as the RSGB Region 11 (Bath and North East Somerset, Bristol, Channel Isles, Cornwall and the Scilly Isles, Devon, Dorset, North Somerset, Somerset and South Gloucestershire) small Club of the Year in 2016 and 2017. At back from left to right: Steve G0UQT (Vice-Chairman and Training Officer), Mark M0SKV (Special Events Manager), Henryk M0HTB, Cyril G3XED (President), Gary 2E0HCC, Dave M3JDK, Joe 2E0EIC and Fred G7LPP (Chairman). We would like to meet you if you have an interest in Radio. It does not matter if you just want to find out more or have been a listener or have used radio before in any form. The club meets every Thursday at the Novers Park Community Centre from about 19:30hrs local time with events starting around 20:00hrs. See the ‘Find Us‘ page which provides static maps powered by Open Street Map (like the one below) and written directions for all modes of travel. Finish time for meetings is variable but formal events, including training sessions, usually complete by 22:00hrs local.